New insights into the control of DNA replication and cell division in Corynebacterium glutamicum, a biotechnologically important microorganism, could help to optimize the industrial production of amino acids. The rod-shaped Gram-positive soil bacterium Corynebacterium glutamicum plays an important role in biotechnology. As its species name indicates, C. glutamicum synthesizes glutamic acid (one of the 20 canonical amino acids found in proteins) in large quantities, and is used for large-scale production of this and many other amino acids. However, yields are constrained by the fact that, in comparison with bacteria like Escherichia coli, corynebacterial cultures grow relatively slowly. LMU microbiologist Professor Marc Bramkamp and his research team have now taken a closer look at C. glutamicum’s mode of growth and proliferation, and uncovered previously unknown aspects of these processes, which can be exploited to enhance its growth rate. 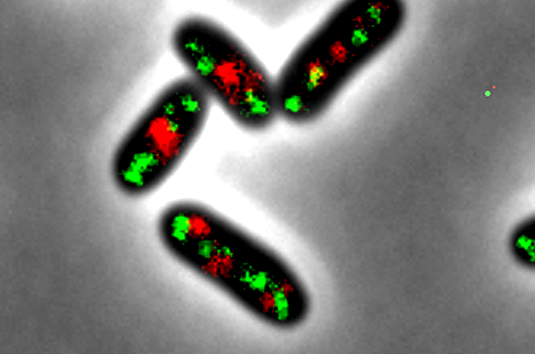 Bacterial cell division is preceded by the replication of the bacterial chromosome(s). Replication begins from a single origin, and entails the segmental dissociation of the two strands of the DNA’s double helix. Localized separation of the DNA strands takes place at what is known as a replication fork. Each strand then acts as a template for the enzymatic synthesis of the complementary strand. The whole process thus leads to the production of two copies of each parental chromosome, which are distributed equally between the two daughter cells. In many bacterial species, including E. coli (which has only one, circular chromosome), generation times are actually shorter than the time taken to fully replicate the chromosome. Microorganisms accomplish this feat by initiating a second round of DNA replication prior to the termination of the preceding one. As a result, daughter cells contain chromosomes with already ongoing new rounds of replication at the time of cell division. This mode of cell proliferation is termed ‘multifork’ replication, because each replicating molecule will contain several replication forks. In addition, the new study shows that C. glutamicum cells normally harbor two complete sets of chromosomes (and are therefore ‘diploid’), while the vast majority of bacterial species are thought to contain only one. The diploid condition confers a number of advantages. For example, it facilitates healing of double-stranded DNA breaks and other types of DNA damage, because the unaffected copy of the chromosome can serve as a template for the repair process. This is of particular significance to bacteria that are exposed to potentially DNA-damaging influences such as UV light. The authors of the new study therefore assume that the diploid character of C. glutamicum represents an adaptation to high levels of environmental stress. C. glutamicum is also closely related to a number of clinically significant pathogens, including the species responsible for infectious diseases such as diphtheria, tuberculosis or leprosy. “Since fundamental cell biological processes in closely related organisms are very often similarly structured, our findings should allow us to make reliable predictions in relation to the growth modes of these pathogens,” Bramkamp points out. He and his colleagues believe that their results will also facilitate efforts to develop new treatments for corynebacterial infections, based on the inhibition of DNA replication.